If you are invited to apply for this visa, you will then have 60 days in which to lodge your online application. Your invitation letter will explain the lodgment process you should follow. You can be in Australia or any other country when you lodge your application. If after receiving two invitations to apply for a visa you do not make a visa application your Expression of Interest will be removed from SkillSelect. You must provide documents that prove the claims you made in your Expression of Interest. These are identified and explained in the Document Checklist. This checklist also explains additional requirements and whether you need to provide original documents or certified copies. Any document in a language other than English must be accompanied by an English translation that has been done by a translator who has been accredited by an organization such as National Accreditation Authority for Translations and Interpreters (NAATI). Translations done by a translator not accredited by NAATI must include that person’s full name, address, telephone number, and details of their qualifications and experience in the language being translated. All supporting documents should be scanned and uploaded with your application. The department will notify you if they need more information and/or documentation. These family members must meet certain requirements. Please read the ‘Including dependent family members’ in your application and ‘proof of dependency’ for more details. To help prepare your application has advice on certified documents, statutory declarations, translating documents, communicating with the department, using a migration agent, authorizing another person to receive information from the department, and receiving assistance with your application. After you have lodged a valid visa application, you will receive a letter of acknowledgement. Your application will be allocated to a case officer and be assessed according to the priority processing arrangements. You will be informed that you have a case officer and be provided with an email address for all future correspondence. The department may make a decision on your application, based on the information you provide. They may also request additional documentation. Any requested documents must be attached online. If you lodged an application for this visa and a case officer has not told you that processing has begun, refer to the current allocation dates. You and all members of your family unit must meet certain health requirements. The department will tell you when to arrange health examinations. Meet character requirements You and all members of your family unit must meet certain character requirements. This means you and each of your dependants (whether migrating or not) who are aged 16 years or older must provide police certificates. These need to be obtained from each country you and your family members have lived in for 12 months or more over the last 10 years or, in the case of those younger than 26 years or age, since each person turned 16 years of age. If the department receives adverse information that could result in you being refused a visa, you will be given the chance to comment on that information. If you are invited to comment, you must do so by a set date. After that date, the department can continue processing your application and make a decision based on information already provided. You can withdraw your application at any stage during processing. To do this, you must send the department a letter of withdrawal including your full name, date of birth, date of application and file reference number/transaction record number (if known). Everyone in the application who is 18 years of age or older must sign the letter of withdrawal. If you apply for this visa while you are in Australia, you may be eligible for a Bridging visa that allows you to stay in the country lawfully while your application is processed. People who already have a valid visa that allows them to travel to and from Australia will not need to do this. 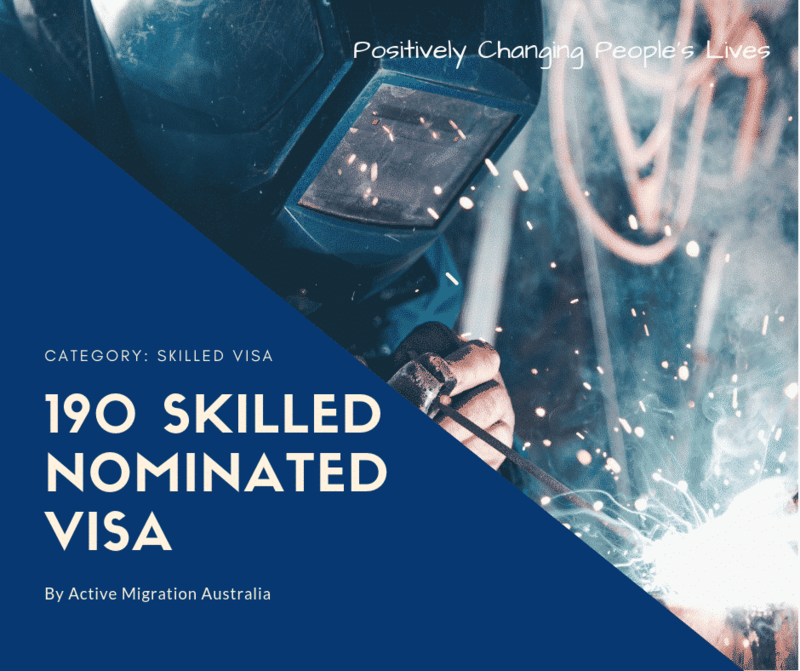 This information explains what is required of you (and your accompanying dependent family members) after you are granted a permanent Skilled Nominated visa (subclass 190). If you are outside Australia when this visa is granted, the department will specify the date by which you must enter Australia.